5.1-channel surround sound: The JVC TH-C30 is the home theater system that will transform your living room into the home theater that you dream of. With 5.1-channel surround sound and an integrated DVD player, all you have to do is take this system out of the box and you're ready to go–just add popcorn. 1000 watts of peak power: This home theater boasts 167 watts per channel, including the subwoofer. Digital decoding: Get the full impact of your movies and music with Dolby® Digital, DTS® and Dolby® Pro Logic II decoding. 5-disc progressive-scan DVD changer: Load the DVD player with up to five CDs or DVDs and enjoy hours of continuous entertainment. Hook it up to a digital TV and enjoy your favorite movies in crisp, clear enhanced definition. Digital audio input: The USB host (2.0 full-speed) connection allows you to hook up your digital audio player (iPod, MP3 players) and enjoy your favorite music in 5.1-channels sound. A/V versatility: Connect the system to your digital video sources with the component video output. Playable formats: Listen to the mixed CDs you created and share pictures from your photo CDs. 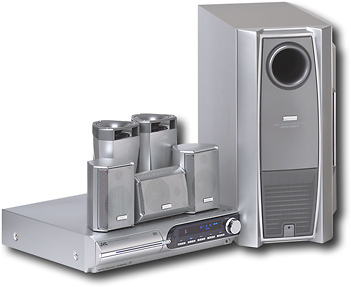 This system can read multiple formats like DVD-R/RW, CD-R/RW, MP3, WMA and JPEG. Wall mountable speakers: The 2-way speakers will compliment any décor. Place them on speaker stands or mount them to the wall. Note: To enjoy progressive scan and high-definition picture, a TV with progressive scan and high-definition capabilities must be used.